If your looking for an easy recipe for half term, here is an easy one to make a Simple Vanilla And Chocolate Cake. Add flour and baking powder into a bowl. Add the butter, eggs, vanilla & sugar. Beat together until well mixed. If the mixture is a little thick, mix in a little milk. Add to a cake tin, bake on gas mark 4 for around 20 Minutes. 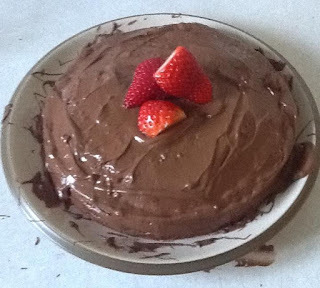 Once cooled add to a plate, melt the chocolate and cover the whole cake. Once dry add the strawberries for decoration, these just about lasted for me to take a picture before they was eaten!